Studio Stories | JohnStevensonMusic.com | JOHN STEVENSON | JRSIV MUSIC LTD. When I began playing guitar in the summer of 1992 at 16 years of age, my main goal was to be able to play some of my favorite songs (some Beatles, CCR, Jimi, etc.) and possibly write some of my own. I woodshedded for hours a day learning chords and riffs, and eventually became good enough to play some favorites. But what really took hold and changed my life was how much I enjoyed writing my own songs and how fulfilling and fun it was. I put together a three ring binder full of original songs by that Christmas, some were good but most were pretty bad. It was difficult to assess some of the songs though, just playing them on acoustic guitar wasn’t what I was hearing in my head. I knew I had to find a way to record my songs to try and realize the sounds I was hearing and have a way to demo them for myself and others. 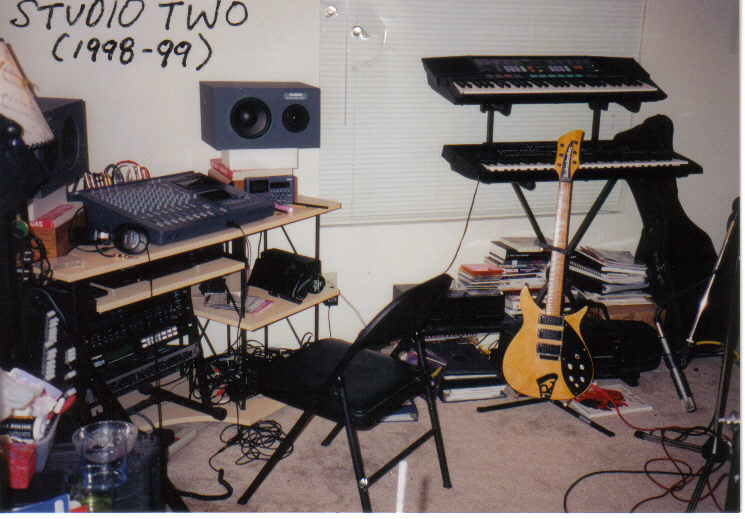 My first demo studio circa 1993. The picture above shows the first solution to my recording aspirations. 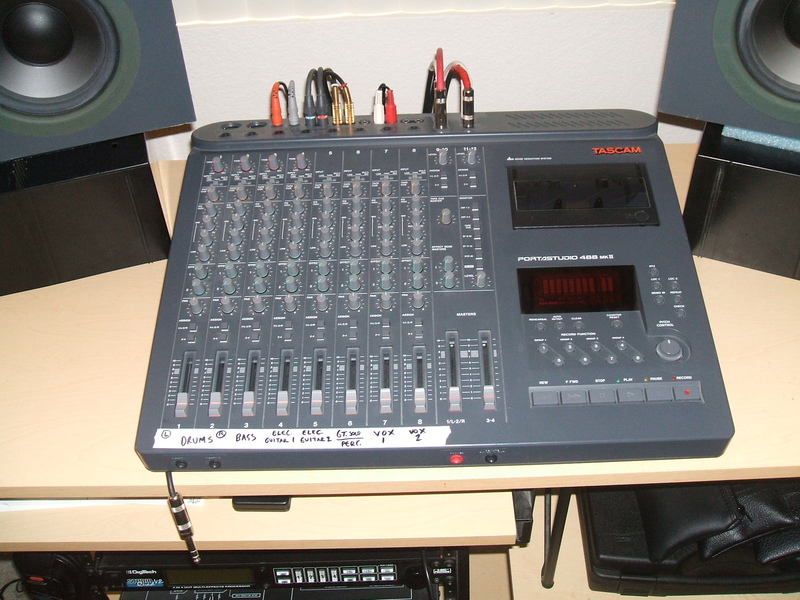 The centerpiece was the Tascam 424 PortaStudio. A four track multitrack recorder, the 424 recorded audio to standard cassette tapes. Where consumer cassettes had sides A and B, allowing one to flip a tape over, the 424 recorded four tracks on the entire length of the tape. This meant that the session tape only had one “side”, four distinct tracks in one direction. The standard pro reel to reel recorders used in studios in the early 1990’s were 24 track machines using huge reels of tape two inches wide. This allowed for increased audio fidelity as more audio signal was printed on the wider tape tracks. Standard cassettes used in the PortaStudios like my 424 were only an 1/8th of an inch wide. Needless to say, the audio quality was nowhere near the big studio machines but they were great for demos and if used properly and with good technique they could produce good recordings. Although it seems stone age by 21st century standards, PortaStudios were really quite amazing and versatile for the time. Home recording enthusiasts five to ten years earlier had to have full on multitrack tape machines and mixers cabled together to record their songs. The all in one PortaStudio made everything more compact and portable, easy to use…more immediate. I took to the recording process right away, quickly falling in love with making complete arrangements by myself. I had started my music career as a kid in the school band playing drums. I played the drums all the way through high school so by the time I started recording I played the drums fairly well on my songs (he says modestly). I bought a bass guitar so I could add it to my recordings and because of it’s similarity to the guitar, took to it quickly as well. So from jump street I could have a full guitar/bass/drums accompaniment to the songs I wrote. I loved the Tascam 424 four tracker but one day a music retailers catalog came in the mail and I saw an EIGHT track PortaStudio for sale. I flipped and had to have it. The Tascam 488mkII Eight Track recorder was incredible for the time, Tascam really pushed the technology of cassette multitrack to the limit. Once again the machine used standard cassettes, and it was frankly an engineering marvel that eight tracks could be recorded on the small tape width. The sound quality didn’t suffer much either which was the important thing. In fact, one of the marketing points was that the signal to noise ratio, wow and flutter and other specs were better than the first 3M 8 track machines. Young musicians today have Macs with digital audio workstations capable of recording 48 tracks without a problem, but in 1995 eight tracks was huge to me and no doubt the thousands of other musicians who used the 488mkII. 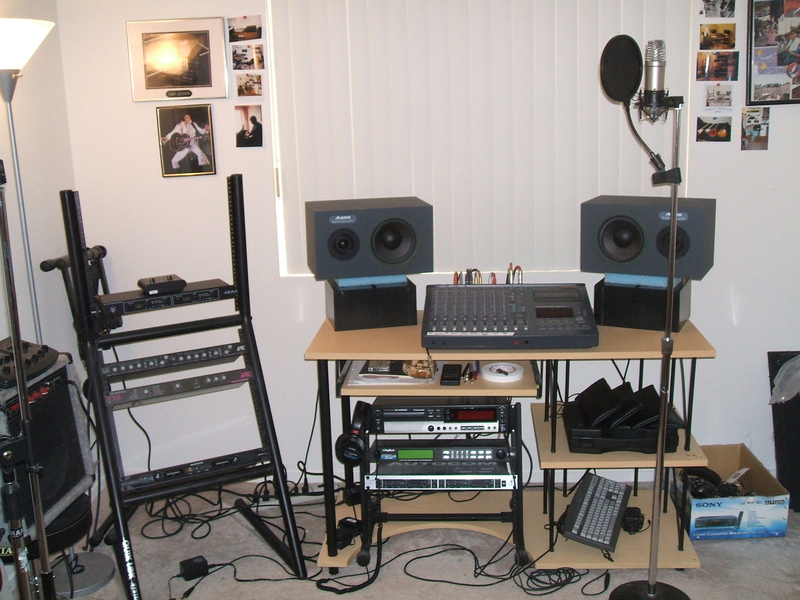 My second demo studio setup with the Tascam 488mkII in place. Having four extra tracks to play with was great but, because of the limitations of the cassette medium, care had to be taken to avoid bad recordings. On a four track recorder, the limitation of ‘just four tracks’ can be upended by a technique called ‘bouncing’. Say you record drums on track one, bass on track two and a guitar on track three. Instead of having ‘just one more track’ with track four, the three tracks already recorded can be played back while track four records them, consolidating the tracks into one. This now frees up tracks one, two and three to be wiped for more recording. This technique, while effective, can cause noise build up and because the bounced tracks are forever joined they can’t be adjusted or changed after the bounce. The Tascam 488mkII’s four extra tracks meant that bouncing wasn’t always a necessity; they could still be done on an eight track, but clean, full recordings were best achieved sans bouncing with just the initial eight tracks being used. 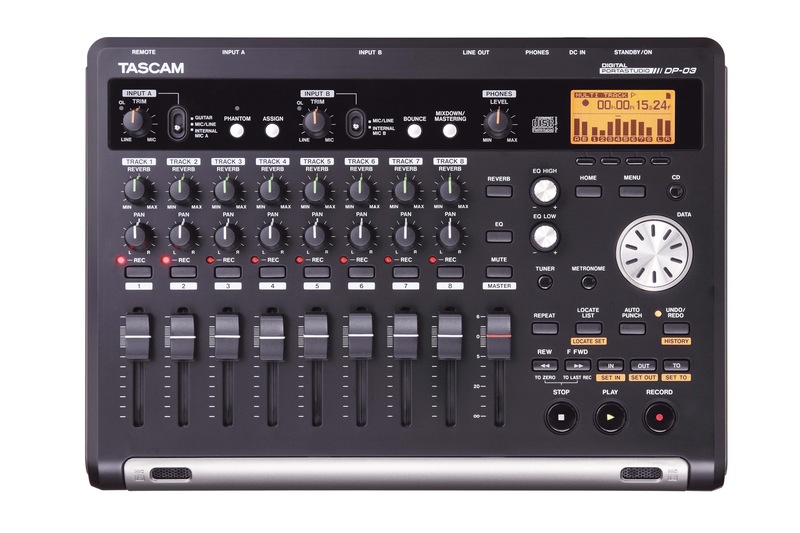 A close look at the Tascam 488mkII. The mixer section of the 488 is so logically laid out and simple to use. In addition to a full EQ complement (high frequency shelving, mid frequency sweepable and low frequency shelving) it offers two auxiliary sends, a dedicated tape cue per track and decent sounding microphone preamps. As my songwriting evolved so did my recording techniques. After studying countless records and reading anything and everything I could find on recording, I feel I could put together a pretty good sounding demo recording given the equipment I was using. Of course that equipment changed and accumulated over my years of recording. 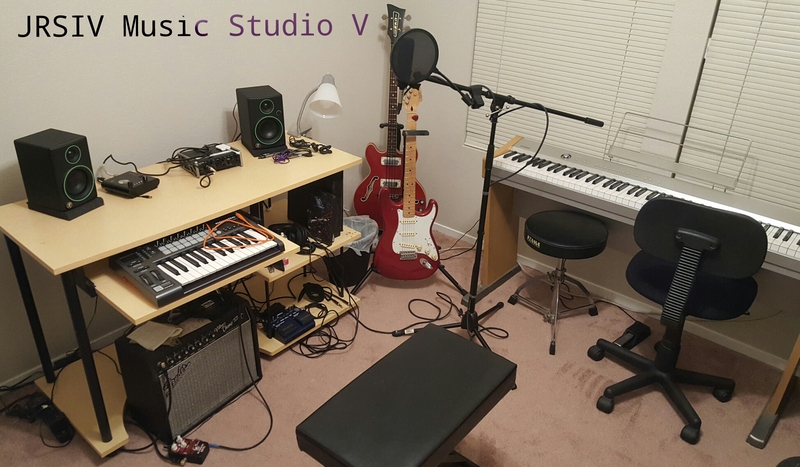 I set up a third demo studio in an apartment but room was tight and it didn’t get much use. When my wife & I got a house I was able to devote a room to nothing but music. This fourth home studio setup was used for quite a few years and was the last studio of mine to be centered around analog multitrack. The equipment details of that final analog cassette demo studio changed a lot in attempt to get the best sound possible. A big step in that direction was recording with an outboard tube mic preamp when using microphones with Tascam PortaStudios. Some pro mixers have great preamps and the modern day digital audio interfaces have some pretty good quality ones as well. The 488’s preamps just weren’t happening though. I used an ART Tube MP preamp for anything with mics (drums, guitar amps and especially vocals). On the subject of mics, the better the mic the better the recording is an axiom that’s pretty obvious. But with a PortaStudio it definitely matters what you put into it; truly garbage in, garbage out. I used cardoid condensers like the Rode NT1A for vocals and acoustic guitars and the classic Shure SM57 for guitar amps, snare drum and other dynamic mic needs. Compression helps put down hot levels to tape and on the cassette multitracks one of the cool things was how hot you could lay down stuff without unpleasant distortion. It warms up bass tracks and makes drums more punchy. I used a Behringer Autocom compressor which had a good noise gate as well. My beloved Digitech Studio Quad was used for effects and I monitored with Alesis Monitor Ones. Keeping the results of the demo recording as clean as possible I mixed to DAT for a few years and then switched to CDR. Having a finished mix on a CD still never ceases to amaze me; the engineers before us used cylinders, shellac discs, vinyl and “good ole’ tape” to archive their precious recordings. Today we have it pretty slick and easy; digital Blu-ray, DVD, CD and lossless audio files with complete random access. Of course optical media wasn’t the only technology taking over. The rise of digital audio workstations like ProTools and the lower cost of more powerful computers and cheaper digital storage was just as much a revolutionary step to home recording as the PortaStudio was. The line between pro studios and home/project studios are forever blurred after computer recording became so accessible to all those who ever wanted to make music. In pro studios today, the DAW rules, but a hybrid approach using Analog and Digital together is being used more and more. Digital fans are seeing the benefits of analog tape especially on drums, bass and guitar and are using tape to warm up the sometimes ‘cold’ sounding digital medium. 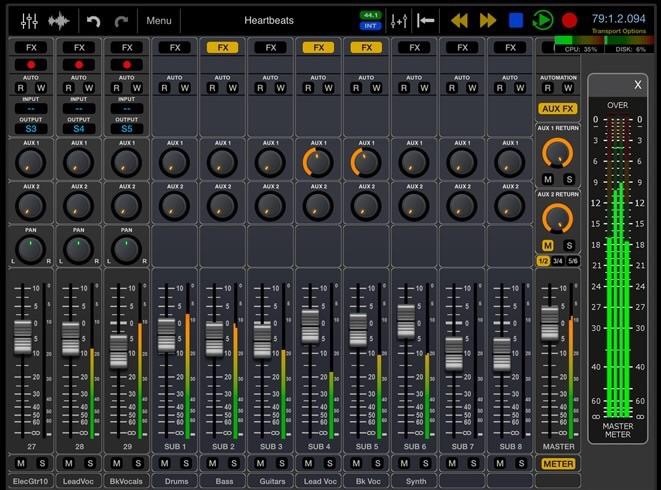 After recording the rhythm tracks on an analog deck, engineers will transfer those tracks into a digital audio workstation like ProTools for further overdubbing. Digital is great for non-destructive editing and it’s undisputed convenience, and it sounds super clean. Adding the warmth of analog by recording some tracks ‘the old fashioned’ way and dumping them into a DAW is a great way to take the best of both worlds. This meeting of technologies is where I’m at in my recording odyssey. When my wife and I moved from our house which had a dedicated studio room to a smaller apartment I used the occasion to overhaul my demo studio, hopeful to learn some new stuff along the way. I began to pursue a Recording Technology degree at the College of Southern Nevada, the SSL console and ProTools HD setup in the “classroom” studio exposing me to high end digital recording. I jumped into digital more than ever but was still keen to use the ‘hybrid approach’ to my own benefit. I have used several DAW’s over the years (Pro Tools LE, Reaper, early versions of Ableton Live) but never gelled with one the way I did with the 488 mkII PortaStudio. I thought that the new digital PortaStudios Tascam had been making would fit the bill for the immediate, tactile response I loved from the old cassette machines but with the clarity and flexibility of the digital domain. I’d used Android phones exclusively since the first ones were available (the cool Fender edition MyTouch 3G being my first) but was no fanboy. Apple’s iPhone seemed fine but I just gravitated to Android. Having no Apple product experience aside from the Macs in studios I went in and at my recording classes, I was blown away when my wife surprised me with a brand new iPad Air 2. I knew of the reputation iOS music production apps were gaining ground and as if on cue this marvel of technology drops in my lap as I’m adapting my studio set up and processes. My wife is the best, a musician and fantastic singer herself, but little did she know the monster the iPad was as a truly professional recording platform. I too had no idea the extent of the quality that some of the iOS music production apps possessed. I spent weeks researching and getting music production apps to suit my needs and tastes. The whole compact, streamlined and once again, immediate nature of the device reminded me so much of the old PortaStudio days, just now with pro level sound and features. The touch surface is an analog knob lovers dream! Tactile response is always preferred over menus and the ingenious ways some developers use the touch interface is amazing. The great thing about using the iPad as my central recording platform is that all my old digital and analog equipment can still be used with it no problem. The DP-03 I got is especially good for taking out to places where I can’t or don’t want to bring tons of mics and accessories, as the iPad still needs an audio interface and outboard mics to get sound into it. The self contained nature of it with the onboard mics and guitar input allows me to use it to capture songwriting jams or performances outside somewhere. Then, those files then can be exported and used in the iPad’s DAW. The iPad recording revolution has spread very fast the last few years so many interfaces are now iOS ready. I got a Tascam US-2×2 USB interface that connects to the iPad via the Lightning port with the camera connection kit that yes, Apple charges handsomely for. The interface can even run on bus power from the iPad making it that much more of a portable recording solution. The magic of the iOS music production scene is the sheer quality and amount of excellent apps available to musicians and producers. The centerpiece to my iOS setup is the amazing Auria Pro DAW. WaveMachine Labs pretty much did what AVID could not or would not do: bring a full featured digital audio workstation along the lines of Pro Tools to the mobile iOS platform. Auria to me does some things better than Pro Tools thanks to the touch interface the iOS runs on. There are too many features to put over and explain here, so if you are into recording and own an iPad, get Auria ASAP. The apps that iOS devs are creating are just mindblowing. DrumPerfect Pro, Final Touch, AudioBus, AUM, BIAS Amp & FX, ToneStack, Patterning, Fugue Machine, all of the incredible synth apps available like Animoog, Neo Soul Keys, the iceGear synths, Manetrons Mellotron, iVCS3…there’s just so many! It takes the whole “Portable Studio” PortaStudio ethos to the Nth degree. On a slate tablet no bigger than a composition notebook you have a full blown DAW, mastering suite, guitar amp sims, all manner of drum machines and groove production environments, tons and tons of keyboard sounds and synths…just on and on. It is amazing and from someone who started on a four track cassette recorder, I never ever take it for granted; I’m quite often stunned by the amazing technology we have to paint our sound pictures with. I am currently taking some rhythm tracks recorded on the 488mkII 8 track and transferring them over to Auria for further overdubs. Many are technically what you’d call stereo submixes, but at the time they were made (early/late 2000’s) they were either test mixes sans vocals or used for lyric writing reference/vocal rehearsal. I always saved them and burned them to CD, as well as mixing the tracks as close to how the finished song would sound. This habit is paying off for me now because like producers in the ’60’s had to do when bouncing, I am able to work off a semi finished rhythm track to get the best possible overdubs and vocal takes. And it helps me avoid the main failing in DAW recording, too many options causing paralysis and/or overproduction. Cutting new demos from jumpstreet on the iOS platform has been great as well. The flexibility with Audiobus and Inter App Audio routing allow so many cool sounds to be captured and experimented with. Not only the immediacy but the intimacy this way of production allows is beyond compare. You can lay in bed at 3AM with your headphones on and be mixing or overdubbing some little synth line to a song…it’s just crazy. It’s like a PermaStudio, it can always be with you, ready to go in seconds. It drives home the incredible advances in technology that a full, 48 track studio with virtual instruments & plugins now exists in the home when the same type of power & facility available when I first started in ’93 was either nonexistent or only available to multimillion dollar recording stars. Studio V, January 2017. 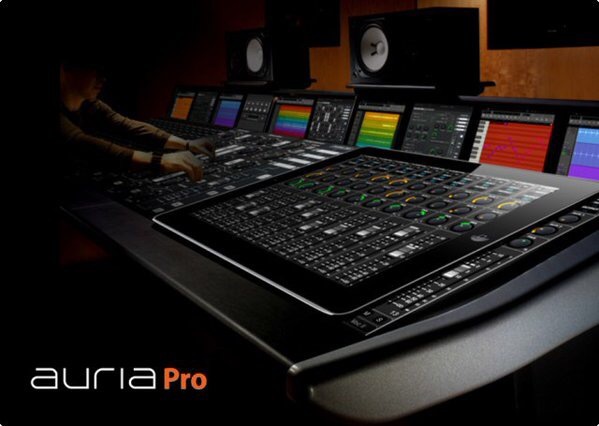 Being built around the iPad DAW Auria Pro, the interface and a pair of 7506’s can be put in a backpack and brought anywhere, making the iOS platform an even more portable option than a laptop, with fully professional, uncompromised results. So, going into 2017, my fifth home demo studio is very streamlined. A desk has my Tascam US-2×2 interface and ART Tube MP mic pre with Mackie CR3 monitors at the sides. I’ve got a couple Shure SM-57’s and a decent Audio Technica AT2020 condenser mic, my old faithful pair of 1995 Sony MDR-7506 headphones along with a new set too. The Mackie CR3 monitors are quite good for small 3 inch woofer multimedia monitors. The response is quite flat and along with the Sony 7506’s and the usual car stereo mix check, it makes for a good monitoring set up. That’s especially true for today’s digital music formats and the way the majority of people are listening to music these days. Of course Genelec or Focal monitors, and others in that over-$1000 range are great and will give you a crystal clear, flat and true response; as a home studio monitor though, and especially when the delivery systems for music today compress, mangle and otherwise compromise the work in some manner, expensive speakers like those may be overkill for project & home studios. I am writing new songs and finishing up some older material as well, I also want to remaster the final mixes of my finished demos recorded on the Tascam PortaStudio’s described in this feature article. Below are three songs recorded on the Tascam 8 track PortaStudio, when I remaster these I will switch them out. Click the play button on the SoundCloud players below to hear the songs. HOT PEOPLE ©2010/2017 JRSIV Music Ltd. FROZEN ©2010/2017 JRSIV Music Ltd. STOPPING OFF ©2010/2017 JRSIV Music Ltd.
You can hear more songs on my SoundClick page at SoundClick.com/JohnStevenson and other music links can be found on the right side column of the site as well. Thanks for reading this feature on the history of my home recording studios and my love of recording in general. All five of the studio setups were similar in ways and totally different in others. I hope that songwriters and musicians who don’t have some kind of recording studio set up in their home will look into the current technology and begin their own odyssey through this world of music, technology and creativity. We live in a world where we can cut records on our phones! Get involved and share your music with others. ©2017 JRSIV Music Ltd. All Rights Reserved. Wow really enjoyed reading this article, im currently doing a music tech course at uni, which is pretty much based around digital recording but for a project ive got coming up ive decided to record a band using a tascam 488 mk2 (im hoping to win one on ebay very soon). my plan is to use a sub mixer for the drums then run that into the 488 and pan them left and right and then use the spare tracks for all the other instruments and vocals im also planning on using some hardware effects during the recording process if you have any advice for me it would be massively appreciated. Pingback: Studio V Is Up And Running… | JRSIV Music Ltd.
John Stevenson | JRSIV Music Ltd. 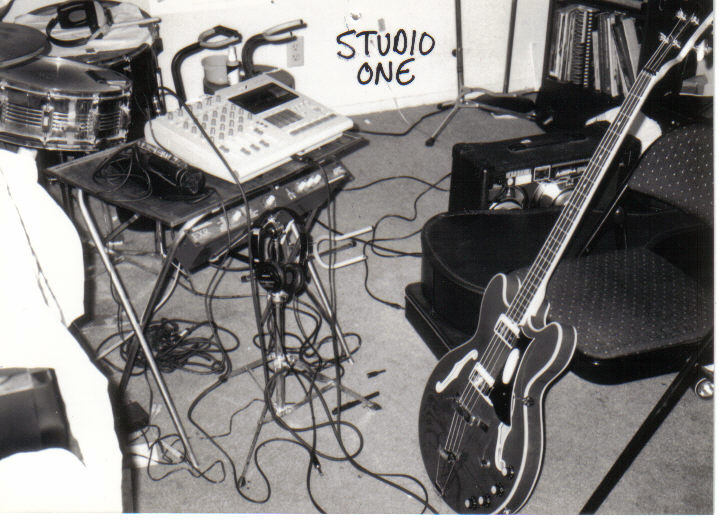 Early ’90’s picture of John recording demos on the Tascam 424 PortaStudio with his Eko Bass.